The FTSE 100, CAC and DAX opened largely unchanged this morning with a reasonable morning from financial stocks offsetting a poor morning for mining companies. 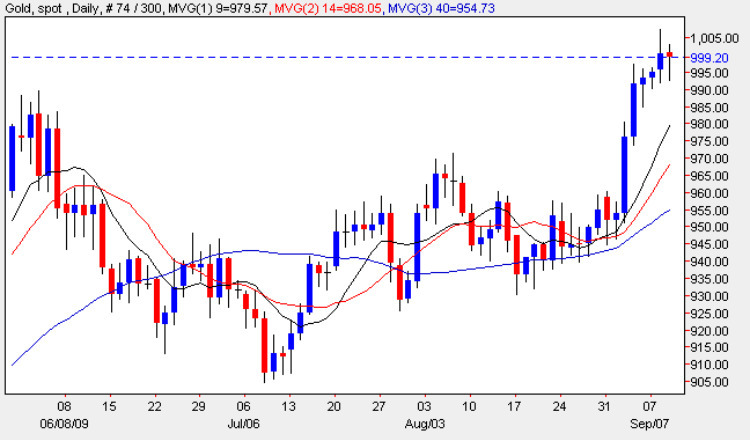 Yesterday the FTSE 100 hit a new high for 2009 of 4971, just 29 points from the psychologically important 5000 barrier. It’s a relatively quiet day on the economic news front with Canadian housing starts at 12.15 GMT and the US beige book at 18.00 the standout announcements for today. The big currency players are yet to show their hand today. Sentiment is mixed across the forex market with the pound and euro down against the dollar, but up slightly against the yen. The biggest movers so far today are the aussie dollar which is down 0.6% after smashing through the 0.86 level yesterday and the USD/JPY which is up around 0.3% as the 92.00 support level holds for now. Daily oil prices enjoyed a strong day yesterday, but for all the headlines about gold, it once again failed at the $1,000 level when seriously tested. This might finally be the time that Gold makes it through the magical level though after a series of fakes in the past, and a bull trade predicting that Gold/USD will be higher than $1,000 in 3 days time which could return 120% is my suggested binary betting trade for today.